Dr. Tay died peacefully at his home in Toronto, after an amazing 101 years of a life that influenced so many through his work in child psychiatry and at The Taylor Statten Camps. He will be missed, but his legacy will live on. In WWII, as a Canadian medical officer, he was one of only 78 Canadian officers chosen to join the British Army in the North African Campaign, and he was awarded the Military Cross for exceptional bravery in the Italian Campaign. As a child and adolescent psychiatrist, first as Director of Child Psychiatry at the Montreal Children’s Hospital, as a professor at McGill University and later with the University of Toronto Health Services, he was recognized as an Honorary Member in the Academy of Child Psychiatry. In 1980, he was inducted as a Member of the Order of Canada in recognition of outstanding achievement for his work with children. If there was an award for exceptional skill in fly fishing, he would have won that as well! For all of this, he was humbly grateful. Tay was the middle child of Taylor Statten (the ‘Chief’) and Ethel Page (‘Tonakela’), Founders of the Taylor Statten Camps in Algonquin Park, where he developed his profound love of the woods, canoe tripping and leadership development. Except for the War Years he spent all his summers in Algonquin Park. He could never get enough of the call of the loon! He shared his skills and experiences with so many and became an inspiration to those who passed through the Camps, many of whom are in leadership positions throughout the world today. He was also a generous contributor to his local community, to the Huntsville Hospital, and to the Taylor Statten Camping Bursary Fund for less fortunate children. 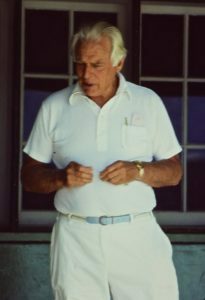 Tay would not have enjoyed such longevity without the support of his beloved wife, Janet (Madam Justice Janet Laing Boland), mother of Michael, (Cathy Taylor), Christopher (Tara) and Nicholas (Laura); and his children, Lyn Statten (Fred Boden), Judy Walter (Eric) and Taylor III, (Suzanne). Tay was widowed twice, predeceased by his wife of 32 years, Alice (Turner), and his wife, Lola Ruth (Hall). He will be greatly missed by his five grandchildren, Michelle Walter, Sean Walter, Phil McCordic, Taylor Statten IV, and Courtney Statten, their spouses, and his six great-grandchildren. The family will be forever grateful for the tremendous care given to Tay in the last three years by Cathy Luceno and Marilou Aurelio. Their devotion allowed him to stay comfortably in his home to the end. To quote a beloved nephew, David Statten, ‘Tay, put down your heavy pack and have a rest…’. The family is planning a Celebration of Tay’s Life in Toronto in September. TBA. In lieu of flowers, please send a donation to: The Taylor Statten Camps Bursary Fund (please specify Dr. Tay Fund) or to The Huntsville Hospital Foundation. Online condolences may be left at www.newcastlefuneralhome.com .